A large earthquake (Mw=7.6) occurred in west-central Taiwan in 1999 with its epicenter near the small town of Chichi (23.85°N, 120.82°E, Fig.1) and the focal depth is about 8 km. The Chichi rupture took place mainly along the north-south stretch of the Chelungpu Fault of about 100 km long and cuts mainly along and within the Chinshui Shale. At the northern segment of Chichi rupture at Shihkang township, the rupture turns to an easterly direction and cut stratigraphic upsection and across the strike of the Cholan Formation. The Cholan-Neiwan area is located near the north-eastern end of the surface ruptures of the 1999 earthquake. 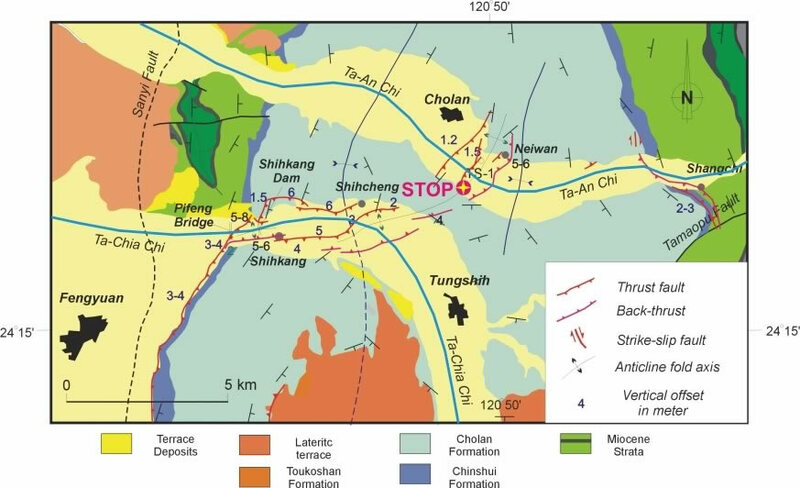 This stop provides an opportunity for examining the Chichi ruptures that form in a conjugate pair and help to “push up” the Tungshih anticline (Figure 2), a decollement fold, as well as examining the coastal sediments of the Cholan Formation that were accumulated during the later stage of the foreland basin development. Map of the northern surface ruptures of the 1999 Chi-Chi earthquake in the Shihkang-Shangchi fault zone (after Lee et al., 2002; see Fig. 3 for map location). The vertical displacements observed on the fault scarps are shown as numbers on the map. Note that the earthquake surface faults as well as the local young folding structures (trending E-W to NE-SW) within the Cholan Formation have obliquely cut across the regional old anticlinal and synclinal fold structures (trending N-S). Field stops are shown as red circles with stars. Field-Trip Stop. 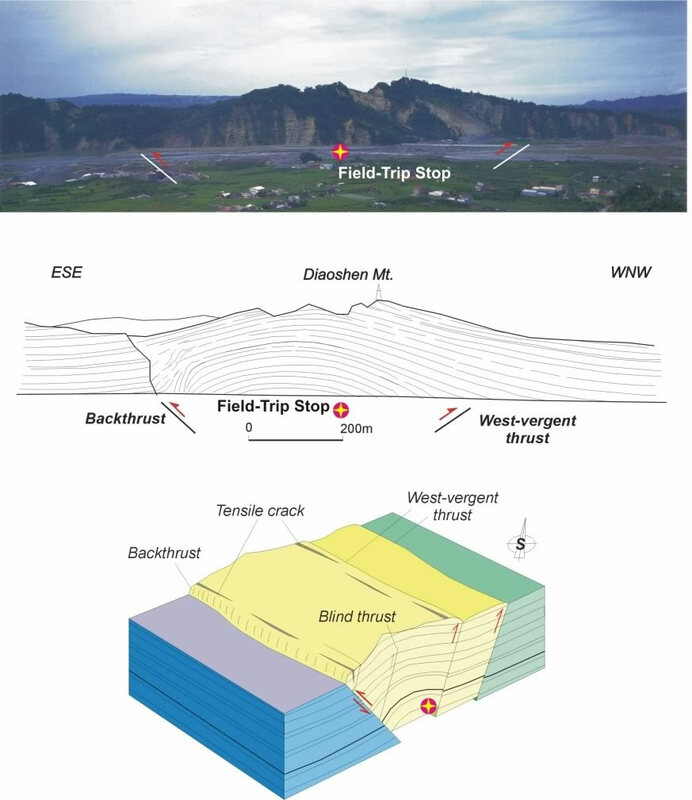 Pop-up structure with thrust-and-backthrust system situated on a pre-existing anticlinal fold, the Tungshih anticline, in the Diaoshenshan area near Neiwan (after Lee et al., 2002). Field stop is shown as red circle. 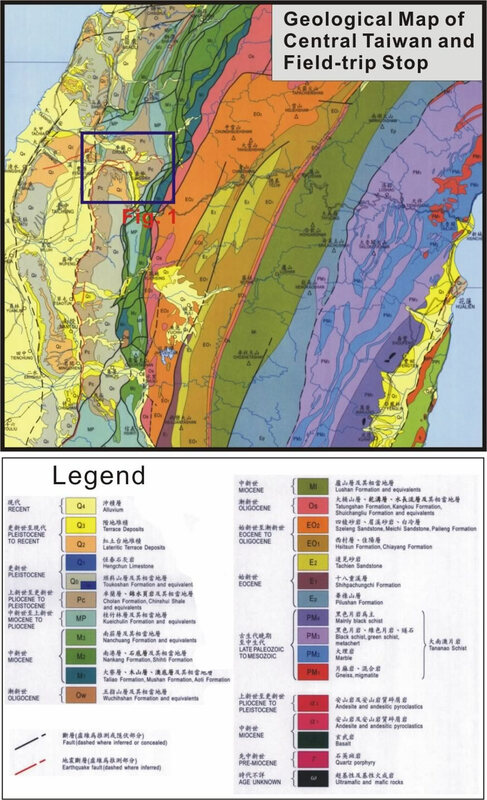 The major thrust of the 1999 earthquake occurred along the backlimb (i.e., left of the above figures) of the Tungshih anticline. 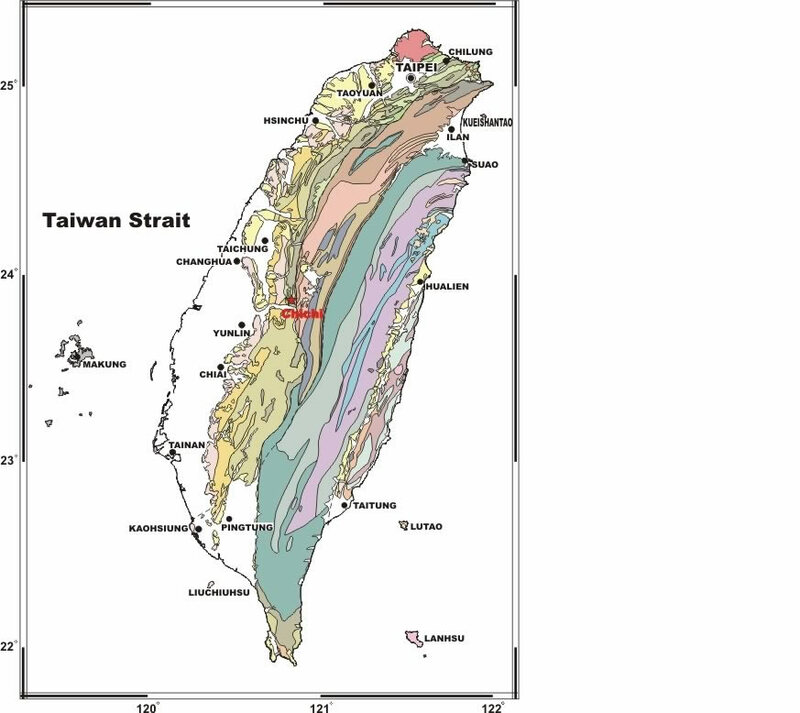 The gentle open fold of the Tungshih anticline probably is part of contribution of several recent earthquakes in a time span of tens of thousand years.